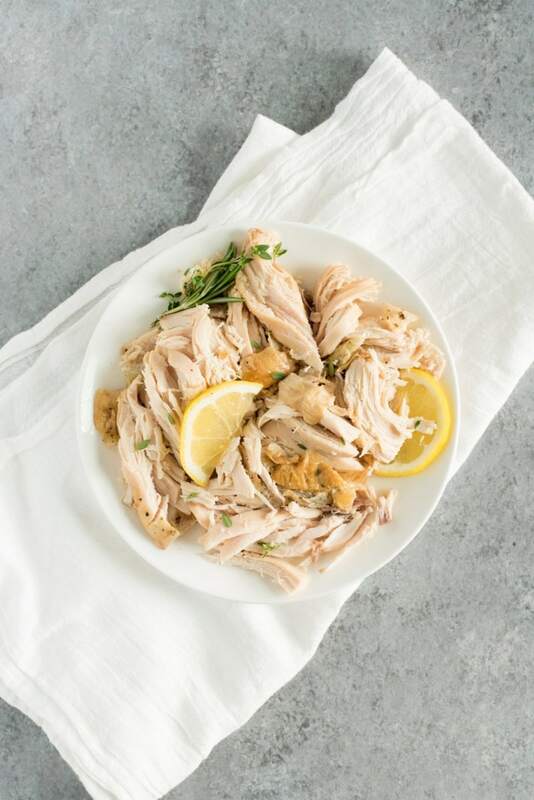 This Fall Apart Slow Cooker Chicken is the easiest way to get tender and moist chicken on the table the whole family will enjoy! Pardon my hubris for a sec, but I gotta put this out there: I’m a bit of a whole chicken cooking expert. You name a method of cooking a bird, and I’ve rocked it (well, minus the whole rotisserie thing—Mama ain’t shelling out $150 for an appliance just to cook a dang chicken). My absolute favorite method for cooking a whole chicken is in the oven. It just can’t be beat when it comes to juicy, flavorful meat and crispy, brown, gorrggeeeous skin. But the one hang-up with the oven method? Time. It’s very unusual that I am raring to start making dinner a whopping 90 minutes before it’s actually dinner time. 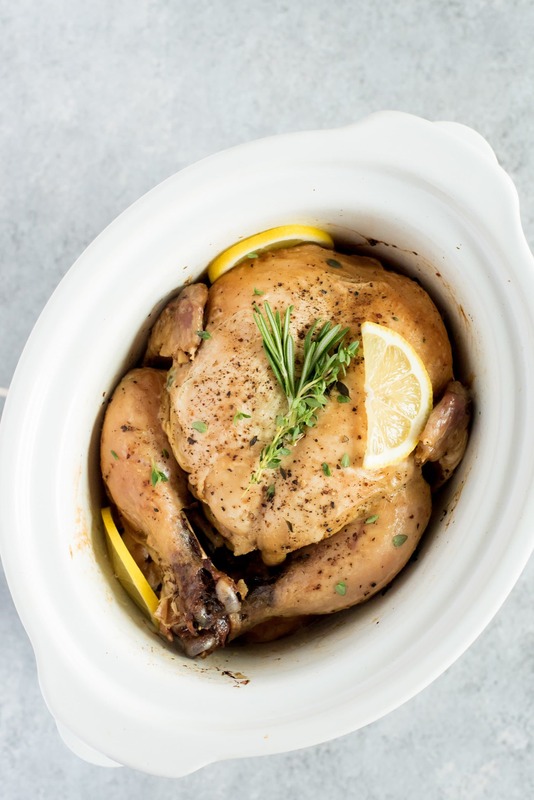 So with that in mind, that leaves two methods to help me get a chicken on the dinner table on a weeknight—the Instant Pot or the slow cooker. And, as much as I pinkfluffyheart my Instant Pot, I have to say, my slow cooker wins here, hands down. 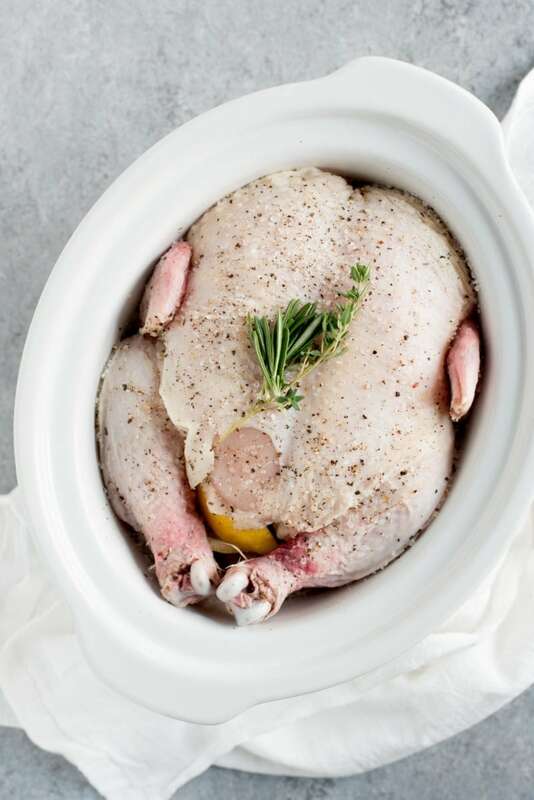 You can’t deny the speed of an Instant Pot—you can cook a whole chicken in about 25 minutes—but I find that the high pressure of the Instant Pot just DESTROYS the chicken. Like, can’t get it out of the pot without it falling to pieces kinda destroys. I know there are other people out there who successfully produce beautiful roasted chickens from their Instant Pot, but I am not one of the blessed. I think one of the joys of a whole roasted chicken is how it’s a totally guest-worthy dinner. You plate that golden brown bad boy, and people ooooh-and-ahhh, even though it took less effort than cooking a box of macaroni and cheese. 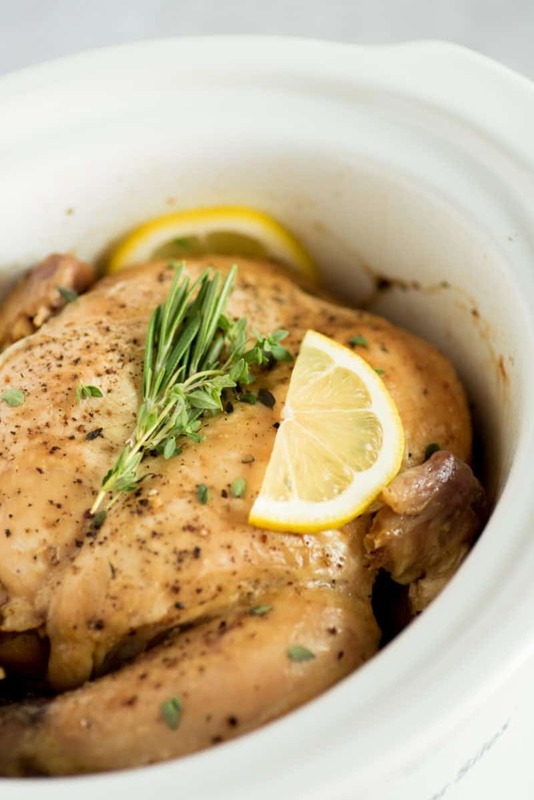 And for me, the slow cooker chicken is the best of both worlds—only about 10 minutes of hands on time and you still get a beauty of a chicken when it’s all said and done. One thing to keep in mind with slow cooking—it’s very moist heat—so you won’t get a nice crispy brown skin right out of the slow cooker. I like to put my slow cooker chicken under the broiler (right in the ceramic carafe from my slow cooker) for a few minutes after slow cooking. It’s a totally optional step, but you can’t beat crispy skin! Because of the moist heat, you’ll also see a lot of juices in the slow cooker when all is said and done. Turn those drippings into gravy or use them as broth for a rockin’ chicken soup the next day! Enjoy. 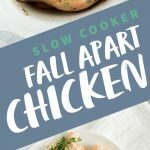 This Slow Cooker Fall Apart Chicken is the easiest way to get tender and moist chicken on the table the whole family will enjoy! Season the skin and inside the cavity of the chicken liberally with salt and pepper. Stuff the onion, lemon, garlic, thyme, and rosemary inside the cavity. Place the chicken in the slow cooker and cover. Cook on low for 6-8 hours, depending on the size of the bird, until meat is tender and literally falling off the bones. To make the chicken skin crispy, carefully transfer the cooked bird onto a baking sheet or pan and place under the oven broiler for 3-5 minutes. Alternatively, you can leave the chicken in the slow cooker ceramic carafe and put the carafe under the broiler for 3-5 minutes. New follower here! 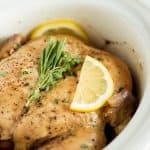 :) I never knew you could do an entire chicken in the crock pot! AWESOME idea, esp for the summer! I don’t work outside of the home anymore, but this is one that I will try. I enjoy using my crockpot, so that when my Tommy gets home, all I have to do is a few veggies and I am done. Thanks for sharing. Hope you like it! This is definitely one of my favorite recipes. :) Thanks for reading! I’m going to try this tonight. All of my weight watcher friends are going nuts for this – apparently every ingredient is zero points except for the dark meat. They can give the legs to their kids!!! My boyfriend turned me on to your website. I love it and I love your great attitude and sense of humor. Thank you!